A heated and at times acrimonious debate exists on whether the Court of Justice’s far-reaching attitude in interpreting EU law should be seen as legal creativity or abuse of power. Bearing in mind the political sensitivity of such discussion, the chapter advises against the temptation to just split between European integration supporters and opponents. The concepts of juridification, judicial activism and judicialisation are first contemplated from a theoretical viewpoint and then applied to the peculiarities of higher education: cultural, economic and societal relevance; centrality of the teaching function; autonomy and collegiality. 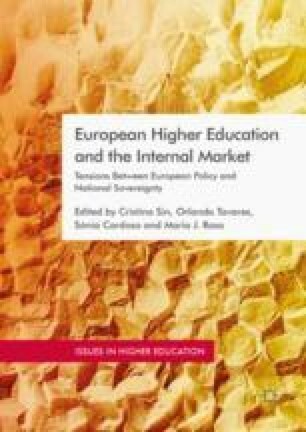 While arguing in favour of a “room for silence” in shaping education policies, including self-restraint by the Court, the authors envisage a greater role of case law beyond the paradigms of internal market. Crisp, J. (2016, June 27). Diplomats: UK Must Accept Freedom of Movement and ECJ to Get Single Market. EurActiv.com. Retrieved September 1, 2016, from http://www.euractiv.com/section/uk-europe/news/post-brexit-britain-must-accept-eu-courts-freedom-of-movement-rules-to-access-single-market-warn-diplomats/. Day, K. (2016, April 19). Michael Gove: Remaining in EU Like ‘Voting to Be Hostages’. Politico. Retrieved September 1, 2016, from http://www.politico.eu/article/michael-gove-remaining-in-eu-like-voting-to-be-hostages-brexit-date-june-23-eu-referendum.